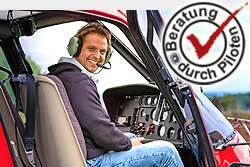 Once to be a pilot yourself and control the helicopter. A dream that not only shapes the childhood. The trial flight "helicopter fly yourself" makes dreams come true and promises an unforgettable experience. The flight hour is similar to a helicopter training. You take personally seat on the pilot place and become on the double tax familiar with the helicopter. No previous knowledge is necessary! A professional flight instructor is at your side. The selected time is the actual flying time.